In the State Library of Victoria we have an amazing photographic collection of ship photo thanks to Allan Green. He was born in Daylesford, in the Central Victorian goldfields on Dec. 23, 1878. His father was a miner. There is a photograph of a sister, Florence, and there were an unknown number of brothers. Our knowledge of this man’s life – if not the published indications of a gentle and kindly soul – are at best fragmentary. We do know that as a young man Allan Green and his brothers set out for the goldfields of Western Australia, in the roaring days of Kalgoorlie and Coolgardie, but – not striking it rich – eventually opened a grocery store in the remote mining settlement of Day Dawn well north of Perth, inland from Geraldton [it is now a ghost town]. Allan Green was never a miner: he had originally worked as helping hand to a blacksmith, and after the store was opened, finding himself left for long periods alone, he started a corresponmdence course in Fine Art, the basis of his water colour painting that followed. Clearly Green was a man of finer instincts than his environment of remote boom and bust mine towns suggest. A photograph of wheat wagon out in WA also suggests he was already working with a camera. Information about his introduction to photography, however, is completely lacking, but everything about the stunning clarity of Green’s plate glass images, and his care in composition, compellingly suggests that he also had some formal training in this art. 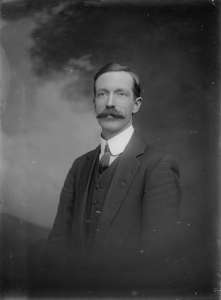 He is seen in the photo here as a young man, in a typical early 20th Century Edwardian portrait, perhaps taken around the time of his marriage to Elizabeth May Cowie, a beauty of Scottish heritage, whom he married at the Town Hall in South Melbourne. 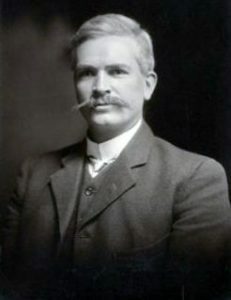 Returning to Victoria in the early years of the 20th Century Green opened a photo studio on Williamstown’s Front Esplanade, which he lived above. While Green no doubt did commercial portrait photography, his own fascination and focus seems to have been was almost entirely maritime, and he clearly spent an enormous amount of time on it. Of the 10,000 or so images Green donated to the State Library of Victoria in 1940 [the number, nominally 8025, is much understated as a result of by multiple images under single subject listings], there are just a few family portraits and few general scenes. The rest is entirely of ships, one of the great collections of its kind. The photograph collection largely consists of Green’s own work, but he also gathered in photos of ships from all around the world, and he sold reproductions of these these from his Front Terrace studios. In truth, the business failed to flourish, and the 1930s found Green working as a newsagent in Melbourne’s tough inner suburb of Richmond, a business that eventually failed during the Depression. Green’s grandson, Mr David Thiessen of Oak Park, Victoria, who passed on this information, tells us that while his grandfather – artist at heart – was never a successful businessman, nor was he much concerned with money. 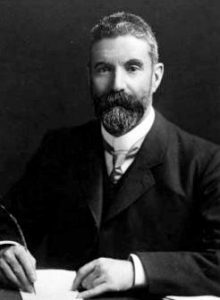 Apart from his time in Western Australia, Green’s only trips outside the State of Victoria were two trips to Sydney, at least one of them accompanied by his grandson. Although only a boy, David Thiessen recalls him photographing warships at Garden Island during this visit. In a tribute published after his death on April 25, 1954, the Port Phillip Quarterly, the author Captain Hartley Watson said that along with sailing ships Green had an early interest in the ships of the Royal Navy’s Australia Station squadron, which preceded the formation of the RAN. This interest continued throughout his life, and just as Sydney’s Sam Hood [1872-1956] is said to have photographed every ship that came into Sydney Harbour over a 60 year period, so too Allan Green captured just about every ship, and certainly all the warships of all nations, that ever appeared in Port Phillip Bay. Australia has had other great maritime photographers: Searcy in South Australia, Izzy Orloff [1891-1983] and Saxon Fogarty in Fremantle, Albert Perrier [1870-1963] in Sydney, and others [not forgetting the newspaper photographers], but in terms of preserved work and significance, Sam Hood and Allan Green seem to stand head and shoulders above the rest. Their styles were very different: Hood, topical, with human interest settings and Sydney scenery; Green, ignoring almost everything but meticulously lucid detail of the ships – the only outside influence to intrude on Green’s images was Melbourne’s notorious weather. Allan C Green 1878-1954, photographer. Initially, there seemed little to this research task. 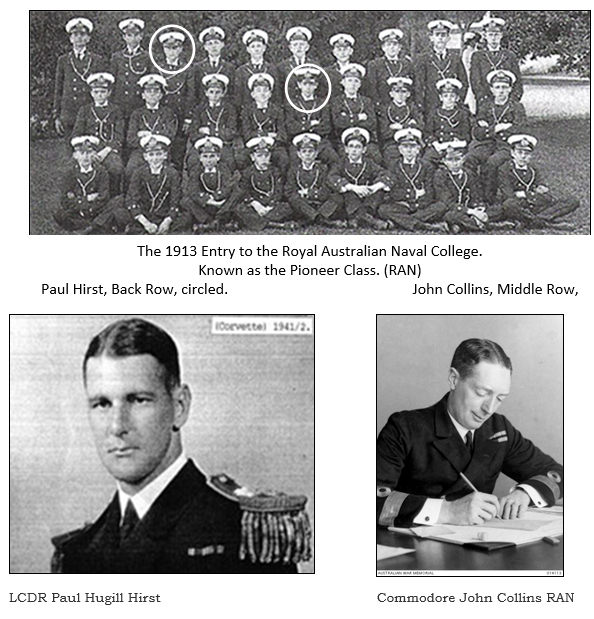 Paul Hirst was a member of the Pioneer Class[ii] at The Naval College and HMAS Toowoomba 1 was Paul’s third command (following Tasmania and Success). Clearly Commodore John Collins and The Naval Board held Paul in high regard. So, in my opinion all that was required was for me to obtain copies of Toowoomba’s Reports of Proceedings from commissioning date in October 1941 to March 1942, seek out the Naval Board paperwork on the incident, the notes by Commodore Collins immediately before and after his decisions on the incident and access Paul Hirst’s personal reports and then write the story. ‘Wrong’. Despite considerable help from many people (most notably Vice Admiral Peter Jones) many cupboards were bare. However, sufficient veteran’s recollections are recorded to allow us the essentials of the story. Several of the class proved notable talents and will be well known to many of us: Vice Admiral Sir John Collins, Rear Admiral Farncomb, Rear Admiral Showers, Captain Burnett and Commander Feldt. 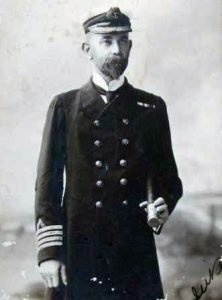 Commander Paul Hirst proved to be a first-class naval officer and commanding officer, however he will not be as well-known as those named above. On arrival in Fremantle, I think it fair to assume that Commodore John Collins inspected the damage to Toowoomba[xii] and that Paul paid a visit to Senior Officer Western Australia Commodore Collins to further explain the structural damages to Toowoomba and to seek time to affect the required repairs. There are no written records extant of either Paul’s visit to John Collins or John Collin’s visit to Toowoomba. The Naval Board were in Melbourne and would not have visited the ship. What I am suggesting is that there may well be several other parts to this section of the story. In particular I have little doubt that Commodore Collins took in Paul’s explanation of the repairs considered essential before Toowoomba could return to War Time duty anywhere, I think it is fair to assume, Commodore Collins, at this time, was (nearly) out on his feet following those hectic days in Singapore, Tanjong Priok and Tjilatjap when all that he was concerned about was the safety of his staff and the prosecution of Australia’s wartime commitments in the region. Vice Admiral Jones makes a most salient point. “The date was 1942, however Paul’s principled stand then resonates today where there is much greater appreciation on ensuring the material condition of ships ‘ship safe’ regime”. [xiii] So I remain bemused that Collins and the Naval Board (apparently) dismissed Hirst’s caution out of hand. Paul then returned to Toowoomba keeping much to himself until the following day. 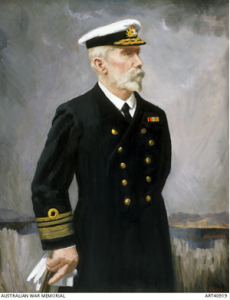 At an appropriate time, he assembled the ship’s company on Fremantle wharf, advised them of his meeting with The Senior Officer Western Australia, Commodore Collins, and told the crew (words to the effect) – “I’ve decided to resign my Commission. I will be returning to my family in Tasmania. You have been an amazing crew. I wish you well for the future”. [xiv] On Paul’s departure a period of considerable gloom settled over Toowoomba. Flags have a long been a fascination of founding Society member Mr Norman Rivett as well as Garden Island in Sydney where he has worked and volunteered for more than half a century. Naturally, receipt of a pre-1967 white ensign in the Society’s office triggered questions in Norm’s enquiring mind. 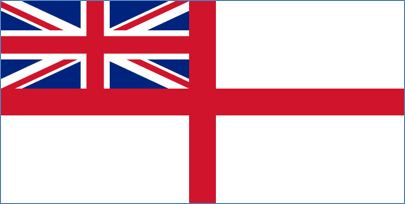 What flags have been flown by British ships in Australia and what was the procedure for changing ensigns? The following research notes have been provided by Mr Rivett. When Society Member, Commander David Quick RFD, QC, RANR (rtd), recently presented the last 1801 style White Ensign worn by HMAS Supply to the Naval Historical Society I was prompted to reflect upon the various ensigns, as distinct from flags worn by ships based at Garden Island, Sydney. I found that there have been four. Of interest also was the process and reporting of how changeovers occurred. My interest in vexillology was sparked some time ago during a visit to the large Naval Yard at Norfolk Virginia, USA One of the several dockyard canteens, was called, “Under Four Flags” commemorating the yard’s historic past. Attractively arranged around a column in the canteen are the four flags under which the yard has served during its long history. The flags are the British Union Flag of 1707, the Virginian State Flag, the Confederate State Flag and the Union Flag of the United States of the 1861 era. In Australia’s case and Garden Island Dockyard in particular, these are the 1606 Naval Red Ensign, 1702 White Ensign, the 1801 White Ensign and the 1967 Australian White Ensign. 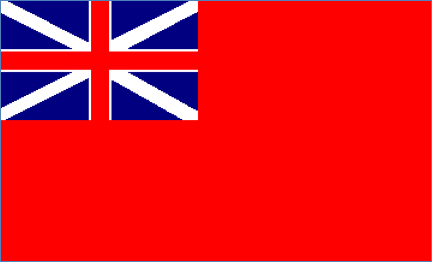 HMS Sirius wore the 1606 Naval Red Ensign. That is with the 1606 Union flag in the canton. HM Armed Vessel Lady Nelson wore the 1702 White Ensign. That is with the Red Cross of St George on the white fly and the 1606 Union flag in the canton. 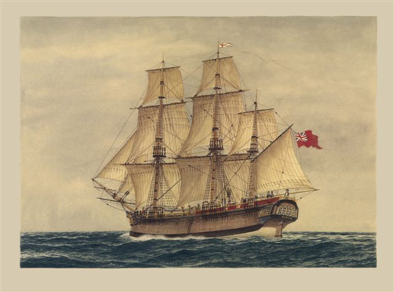 On the occasion of King George III’s birthday on Tuesday 2 June 1801 at 0845 “Lady Nelson” became the first ship in the colony to wear the 1801 Union flag (introduced in the United Kingdom on the 1 January 1801). The wearing of the 1801 White Ensign would have been in order from that moment if one had been brought out from the UK with the new Union flags. Lady Nelson was occupying Garden Island during this period. HMCS Protector commissioned as HMS Protector late 1900 for service in China during the Boxer Rebellion was the first Australian ship to wear the 1801 White Ensign. HM the King approved of the Naval Forces of the Commonwealth being designated as His Majesty’s Australian ships. 200. 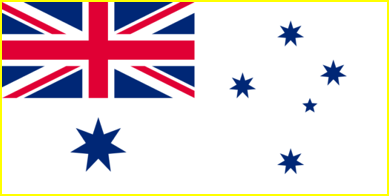 All ships and vessels of the Royal Australian Navy shall fly at the stern the White Ensign as the symbol of authority of the crown, and at the jack staff the distinctive flag of the Australian Commonwealth. The Australian White Ensign was introduced on 1 March 1967. The Account by Commander David Quick RFD, QC, RANR (Ret) of the change of ensigns aboard HMAS Supply on the 1st March 1967 had a precedence aboard the “Lady Nelson” in Port Jackson on the 2 June 1801. The “Lady Nelson” was occupying Garden Island at this period. “The present Union” referred to was the 1606 Union flag and the Association was a body of volunteers called the “Sydney and Parramatta Royal Associated Corps”. Surprisingly no reference is made to the new White Ensign with the 1801 Union flag in the canton but it is inconceivable that the Admiralty would have failed to provide new ensigns along with the new Union flags. Given the 75th anniversary commemoration events taking place around Australia and overseas in 2017 to honour ships lost in the RAN’s darkest year, 1942 it is timely to reproduce the full list of Royal Australian Navy vessels lost since 1914. The table below was prepared by the Directorate of Strategic and Historical Studies in the RAN’s Sea Power Centre, Canberra lists 31 vessels lost along with a total of 1,736 lives. HMA Submarine AE1 14-Sep-14 35 Vicinity of Blanche Bay, New Guinea Disappeared following a patrol near Cape Gazelle, New Guinea. Thought to have struck a coral reef near the mouth of Blanche Bay while submerged. HMA Submarine AE2 30-Apr-15 0 Sea of Marmara, Turkey Scuttled after action against Turkish torpedo boat. All crew became POWs, four died in captivity. Wreck located in June 1998. HMAS Goorangai* 20-Nov-40 24 Port Phillip Bay Collided with MV Duntroon. No survivors. HMAS Waterhen 30-Jun-41 0 Off Sollum, Egypt Damaged by German aircraft 29 June 1941. Sank early the next morning. HMAS Sydney (II) 19-Nov-41 645 207 km from Steep Point WA, Indian Ocean Sunk with all hands following action against HSK Kormoran. HMAS Parramatta (II) 27-Nov-41 138 Approximately 25 miles north of Bardia, Libya Sunk by German submarine. 24 survivors. HMAS Perth 01-Mar-42 353 Sunda Strait Sunk by Japanese naval forces in the Sunda Strait. 328 survivors, 4 died after making landfall. 106 died in captivity. The remainder, 218, were repatriated during or after the War. Wreck found in 1967 by David Burchell. HMAS Yarra (II) 04-Mar-42 138 South of Java Sunk by Japanese forces. 13 survivors. HMAS Vampire 09-Apr-42 9 Vicinity of Batticaloa, Ceylon (Sri Lanka) Sunk by Japanese aircraft. 122 survivors. HMAS Kuttabul* 01-Jun-42 21 Sydney Harbour Torpedoed by Japanese midget sub in Sydney Harbour. HMAS Nestor 16-Jun-42 4 Mediterranean Sea, between Crete and Libya Damaged by enemy air attack, straddled by 2 heavy bombs, 15 June 1942 causing serious damage to her boiler rooms. Taken in tow by HMS Javelin, scuttled the next morning. 245 survivors. HMAS Canberra 09-Aug-42 193 Vicinity of Savo Island Scuttled following action against Japanese forces in the Battle of Savo Island. 612 survivors. Wreck found by Robert Ballard in 1992. HMAS Voyager 25-Sep-42 0 Betano Bay, Timor Ran aground at Betano Bay, Timor 24 September 1942. Destroyed by demolition charges the next day. HMAS Armidale 01-Dec-42 40 Vicinity of Timor Sunk by Japanese aircraft en route to Timor with Netherlands East Indies evacuees. 43 survivors. In addition to the 40 Australian casualties, 60 NEI casualties. HMAS Patricia Cam* 22-Jan-43 8 including 3 civilians Near Wessel Island, N.T. Sunk by Japanese aircraft while carrying 6 passengers. Of the 17 survivors, 1, a civilian, was taken captive by the Japanese and later executed. HMAS Adele* 07-May-43 0 Port Kembla Wrecked by storm. HMAS Wallaroo 11-Jun-43 3 Near Fremantle Collided with US Liberty Ship Henry Gilbert Costin. 82 survivors. HMAS Silver Cloud* 12-Jul-43 0 Sydney Harbour Damaged by fire and declared for disposal. Purchased by Halvorsen and Sons and repaired. HMAS Matafele* 20-Jun-44 37 including 13 Pacific Island seamen Presumed south coast of Papua Disappeared en route Townsville to Milne Bay. Presumed foundered sometime on 20 June 1944. HMAS ML430 13-Aug-44 0 North of Biak, New Guinea Sunk by friendly fire from ML819. HMAS Geelong 18-Oct-44 0 North of Langemak, New Guinea Sank after collision with US tanker York. 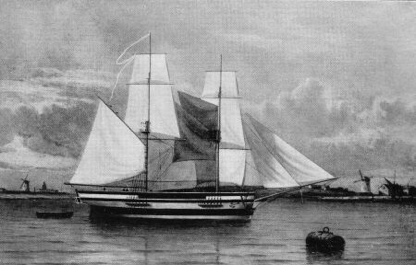 All crew rescued by York. HMAS ML827 20-Nov-44 0 Off New Britain Island Ran aground in Rondahl Harbour, east of Waterfall Bay, New Britain on 17 November 1944. Refloated 3 days later but capsized under tow 20 November. HMAS Terka* 26-Mar-45 0 Madang Harbour Foundered for no apparent reason in Madang Harbour. 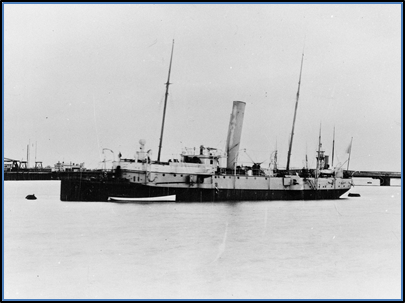 HMAS Watcher* 14-May-45 0 Hervey Reef Wrecked on Hervey Reef NE of Thursday Island. HMAS Warrnambool 13-Sep-47 4 Cockburn Reef, Qld Struck a mine while conducting mine clearance work. Classed as a war loss. Wreck location known. HMAS Woomera 11-Oct-60 2 Off New South Wales Coast Sank after an explosion and fire during ammunition dumping operations. 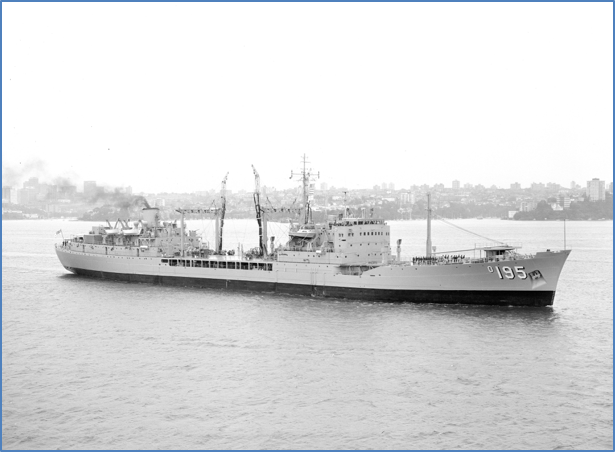 HMAS Voyager (II) 10-Feb-64 82 Off Jervis Bay Collided with HMAS Melbourne. Destroyed by fire triggered by welding activity.